When Do Comps Requests Cross the Line? ‘‘(1) Consider additional, appropriate property information, including the consideration of additional comparable properties to make or support an appraisal. ‘‘(2) Provide further detail, substantiation, or explanation for the appraiser’s value conclusion. ‘‘(3) Correct errors in the appraisal report. Answer: The text they sent you is correct and from the law. Is the fact that they sent you “comparables” an attempt at influence? Maybe. Depends on the quality of your appraisal and the quality of their “comparables.” One way to measure “influence” is- did the “comparables” they send all have sales prices higher than your appraised value? If they are, then it appears to be an attempt at pushing the appraiser to a higher value (influence). If, and this is a big if, what they sent are better comparables, they would likely have prices below and above your value point. Since they ALL have prices above your value and – let me guess – likely not “comparable” (shock), it appears to be an attempt at influencing the appraisal outcome– an illegal act. Comparables should bracket the subject, some higher in price some lower, bigger and smaller, younger and older (etc.). If this is what they sent, then maybe…. just maybe….. they are trying to improve the quality of the appraisal. Next point– who decides that they are “comparable” and “appropriate?” Likely, it is someone with a financial interest in the property – hmmmmm? People are allowed to interact with the appraiser to try to help by sending information. However, it’s a razor’s edge between help and influence. Every lender and AMC is required to have written policies and procedures that outline what is allowed and what is “influence.” My suggestion is to have the lender/AMC send you a copy of their written policies and procedures regarding the additional information. And if they don’t have them, you have the option of letting their federal regulator know about the failure. Nicer Solution: you can give them a simple reply: “I did consider these sales in the original appraisal process. None of them were considered superior to the comparables used in the report.” Place it on your letterhead, PDF and send it back. This blog is an information exchange by and for appraisers on the best AMCs to work for. Check out this one and other by visiting the Blogs tab of our Main Menu. Enjoy an OREP/Working RE discount on McKissock’s new 7 Hour USPAP online continuing education course, approved in most states. Taking this mandatory continuing education coursework is now affordable and convenient with this new online course. Visit WorkingRE.com and click USPAP CE at Cost to learn more. 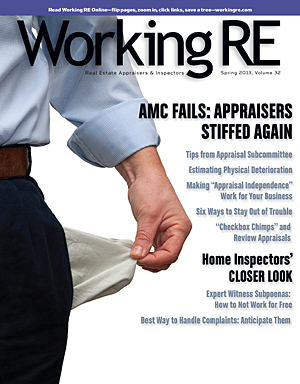 The new edition of Working RE is dedicated to home inspector issues only. 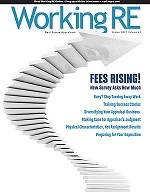 Find a link to the PDF magazine at WorkingRE.com. Appraisers getting stiffed by appraisal management companies (AMCs) that declare bankruptcy or simply fail to pay remains a hot-button issue for the industry. JVI Solutions is one of many in the last several years to leave appraisers with a mountain of unpaid invoices. But this story, unlike so many others, has a happy ending, with one lender stepping up to make good on its share of JVI’s unpaid debts. FHA work is booming. Here’s an opportunity to make your FHA appraising faster and more efficient. The FHA Appraiser Inspection Checklist, Checklist Instructions and eBook is designed to get you up to speed and more efficient at FHA appraising. The Checklist serves as a field guide for completing your reports. The Instructions explain how to complete the two-page checklist line by line. The eBook saves you time and money by summarizing and organizing the material you need to know. Author/appraiser Lore DeAstra says, “We reviewed more than 450 pages of HUD materials and spoke with several HUD officials to compile the FHA Appraiser Inspection Form, course materials, and eBook. It will save you time and money.” The guide is updated with the following: formatting updates for improved ease of use: more concise information in an easy-to-follow eBook searchable by topic; web links to topics for easy access; symbols and pictures included by topic for at-a-glance comprehension to FHA Checklist; FAQ from appraisers and lenders by topic with detailed index by page; over 10 new ways to access information and contact FHA to check competencies and get help fast! For more, see the inside back cover or go to WorkingRE.com and click Improving FHA Appraising under the Resources tab. “Differentiating yourself from others improves your business and marketing efforts,” says author Lore DeAstra. “These revised materials will help you obtain additional avenues of income pertaining to your FHA expertise now and into the future.” OREP insureds enjoy a discount. According to Gerald A. Kifer, Supervisory Appraiser at the Veterans Administration (VA), his agency’s goal is to increase VA fee appraiser panels by 25 percent by the end of the fiscal year 2013 (September 30, 2013). All fee appraiser applicants must be state-licensed or Certified and meet all additional VA qualification requirements as detailed on VA’s website (Benefits.va.gov/homeloans/appraisal.asp). According to Kifer, the VA Regional Loan Centers are the primary point of contact for applying. Read the entire story, VA Recruiting Appraisers Nationwide first published in Working RE’s Online Edition in November, 2012, at WorkingRE.com.